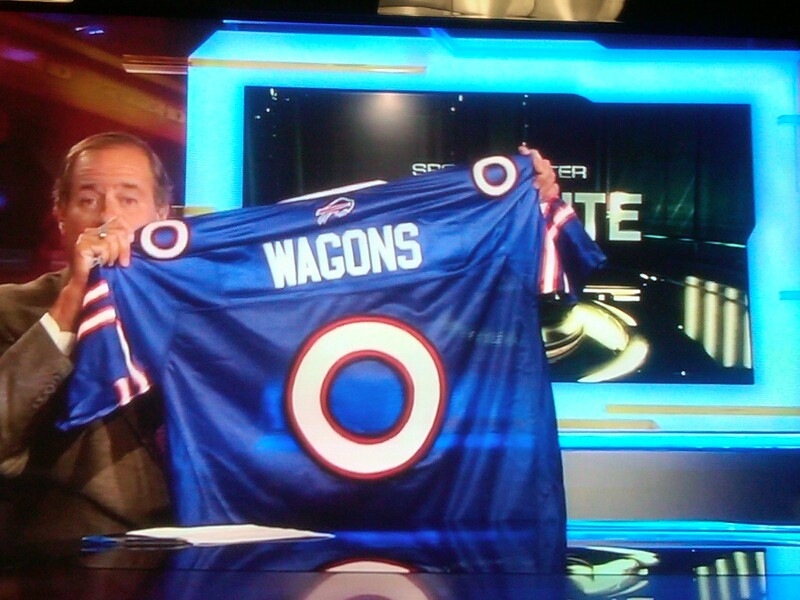 The Bills made sure to send ESPN NFL anchor Chris Berman one of the new 2011 jerseys for the regular season, with a special number and name plate on the back. Berman unveiled the jersey in his first Two-Minute Drill segment of the season on ESPN Thursday night. Take a look (below). Enjoy the holiday weekend Bills fans and remember if you’re in the military take advantage of submitting any service photos from overseas, especially if you’ve got Bills gear in the shot. We’re doing a military Bills fan photo gallery tribute on July 4th on Buffalobills.com. Just send your photos and info to me at AskChris@bills.nfl.net. Could you clear up some confusion on the part of Bills fans? Many fans have said on the message boards that blue pants are going to be used but just weren’t ready for the recent unveiling. Hopefully that’s true (although hard to believe they wouldn’t be ready) as I think the blue pants with white tops looks 100% better than white on white (“long underwear” look IMHO). Please clear this up once and for all for all of the fans, the majority of which seem to want the blue pants also. 9 years of white on white was enough! CB: What I have been told by our people at One Bills Drive is the following. The away uniform in 2011 will feature white pants with a white jersey. Last I heard, NFL Network was still not able to find a team to follow via their reality television show Hard Knocks. They were turned down by the Jets for a second season, the Cowboys and another team I believe. Are the Bills not interested in this opportunity? Have they contacted NFL Network on this topic? I for one believe it would help the regionalization efforts with Toronto and getting a more engaged fan base from the north. CB: You make a valid point, but I’m not in a position to speak for Buddy Nix or Chan Gailey and what they’d decide. Having been around them the past calendar year and seeing how they operate, I’d be surprised to see them sign off on something like that. They’re both old school football men that just want to go to work and get the job done. Having to deal with cameras following them wherever they go during the busiest time of their calendar year doesn’t sound like it would jive with their way of doing things, but obviously that’s their call not mine. With all the hype going on with Terrelle Pryor I was wondering about other quarterbacks that could be taken in either free agency or the supplemental draft. I am pretty sure Pat Devlin is still on the market and I liked his numbers and physical traits. I also heard he has the intangibles to be a NFL quarterback. Is there any chance the Bills get him? CB: It’s certainly possible that the Bills will add another young arm to their quarterback contingent, but I think it’s far more likely that they add a veteran that they feel is capable of backing up Ryan Fitzpatrick. They already have a young developing arm in Levi Brown, so I would anticipate them adding someone that’s had some time in the league and been on the field a fair amount on Sundays. Buddy Nix said earlier this offseason they may very well add two more quarterbacks, but the fourth in all likelihood would be another passer for camp and if he impresses maybe he sticks around in some capacity. That’s where an additional young signal caller might come into play. Thanks for all you do to keep us fans up to date. That goes double for those of us that have moved away from upstate NY, but still call Buffalo home. I have a question about the Practice Squad. Can another team just sign a guy off of our Practice Squad any time they feel like it? Do we have to agree to let that player go? Do we get compensated if they take one of our guys? I’d sure hate to see a guy like Jasper or Batten end up in New England and become a real monster that we have to play against twice a year. CB: Unfortunately yes, another team with an opening on their 53-man roster can pluck a player off of any team’s practice squad at any time. There are some measures the original team can take to prevent losing the player if they covet him. One is to offer him an active player contract (practice squad players make less) and a spot on the active roster. The Green Bay Packers tried to do that when the Bills went to take Brian Brohm off of Green Bay’s practice squad. They offered a deal equal to that of the Bills contract, but Brohm still chose to leave. More than 95 percent of the time the practice squad player leaves because the new team that signs him has to keep him on their active roster for at least three weeks, so it’s a genuine opportunity to get on an NFL field on a Sunday, especially if the team they’re going to has had a rash of injuries at said player’s position. Thanks for all your work. I was wondering where you think that Johnny White will be in the backfield. With Fred and CJ carrying most of the load, do you see him more as a returner or do you think he will get some carries. I think he can develop into a complement to CJ once Fred leaves. CB: I see a lot of special teams work ahead for Johnny White, who can serve in a lot of roles on that unit. I could also envision him being a goal line back as the season wears on. The kid runs downhill… hard. He’s an inside runner primarily, so if they want to take some of the wear and tear off Fred I could see him spelling Jackson a bit here and there. However, if he gets more than 4-8 touches a game on offense as a rookie I’d be surprised, just because of who is in front of him on the depth chart. 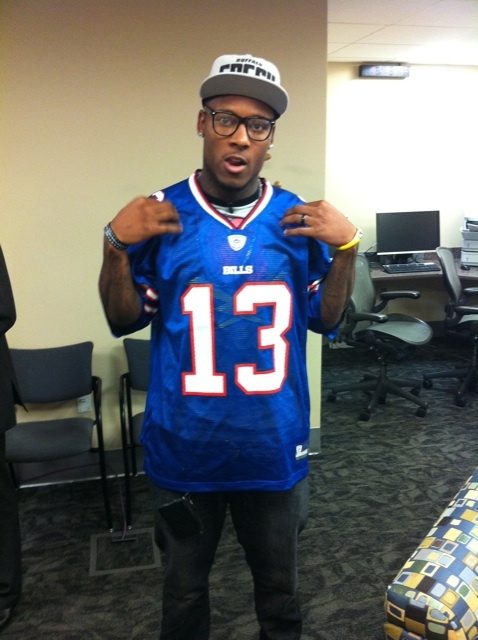 Bills WR Stevie Johnson, who has a big interview day at ESPN, is sporting the team’s new look in Bristol, Connecticut today. Here’s a shot of Stevie courtesy of ESPN producer Jason Romano. With the unveiling of Buffalo’s new uniforms over the weekend and today’s introspective look at how the final design came together in the media center at buffalobills.com, it should also be noted that the Bills players had more than their share of input in the uniform design as well. TV testing was an important component of the jersey design because sometimes the color of the jersey doesn’t always come through properly on television, particularly HD. The Bills wanted to make sure that wasn’t an issue with their royal blue look. With the unveiling of the new uniforms last night also comes some important information if you’re in the market for C.J. Spiller or Leodis McKelvin jersey. If you’re planning on ordering a Spiller or McKelvin jersey be prepared for a different number than you were anticipating. They’ve swapped jersey numbers for 2011. McKelvin will be wearing jersey number 21 while Spiller will be wearing jersey number 28. Spiller wore 28 in college and presumably approached McKelvin about swapping out numbers. Bills players were interacting with Bills fans on twitter Friday night and early Saturday following the team’s new uniform unveiling. Both the fans and players were overwhelmingly positive. Here are just a few examples as Roscoe Parrish, Donald Jones and Stevie Johnson were busy. Leading up to the 2011 uniform unveiling Friday night was an untold uniform story on buffalobills.com about how the club changed the helmet color to help then quarterback Joe Ferguson to better distinguish his receivers from the opposition. Bills HOF QB Jim Kelly had heard this story, and what’s ironic is he too is color blind. “I’m color blind and I’ve never had any problems with it even though we had red helmets when I played,” said Kelly. Kelly said instead of looking at helmets, he distinguished his teammates from the opposition by looking at the jerseys. Bills Hall of Fame QB Jim Kelly, who was part of the Bills uniform unveiling Friday night felt the new uniforms harkened back a bit to the jerseys he and his teammates wore in the early 90’s. Kelly played his entire career with the Bills in a red helmet with the charging buffalo. “Bringing back the blue brings back great memories in my mind,” Kelly said. It never truly left because there were part of the accent colors on the helmet and pants of the previous uniform (2002-2010), but to see royal blue as the dominant color again for the Bills newest edition of uniforms (2011) is a welcome sight. For more on the whole look go to the home page at Buffalobills.com. The Bills went back to their original white helmets, but there are a lot of new tweaks to it and it’s not just a flat white. For more on the new helmets check the home page at Buffalobills.com. ESPN football anchor Chris Berman, a huge AFL fan and Bills supporter over the years, is just as pumped up for tonight’s uniform unveiling as any Bills fan might be right now. Berman isn’t sure what to expect, but is glad to know that the charging buffalo will remain a part of the new look. Berman knows fans have their opinions about the Bills uniforms over the years, but in the end he believes it’s what the players do on the field in those uniforms that carries the most weight with fans. “Whatever uniform gets them to 10-6 and the playoffs will be the most popular one among fans so hopefully this one does the trick,” he said. Just a reminder that the American Red Cross will be hosting the 5th Annual Buffalo Bills Blood Drive in the Paul Maguire Club from 11– 7 today. Walk-ins are welcome so if you’re coming to the uniform unveiling tonight stop in early and donate beforehand. If you would like to make an appointment to donate blood call 1-800-RED CROSS. All donors will receive receive a free American Red Cross and Buffalo Bills t-shirt, tickets to the Buffalo Bills Uniform Unveiling later that evening as well as be entered to win many other great prizes. There will also be appearances by Billy Buffalo and the Jills throughout the day. Jickster from 97 Rock will also be hosting a live remote from 11 AM – 1 PM in the club. Bills long time equipment manager Dave Hojnowski and his co-workers work almost as closely with the players as the coaching staff, so it affords them the opportunity to pull a fast one on players now and then. Hojo and his cohorts will target rookies to see how gullible they might be, or try to cross up a new arrival in Buffalo’s locker room. Here’s the often used shoelace riddle that still gets a player to this day. The power of fractions also came into play once in a while when it came to helmet size. Back in 1980 in addition to the introduction of white jerseys with blue pants the Bills also began wearing wide mesh jerseys for increased breathability. However, as Bills equipment manager Dave Hojnowski tells us the wide mesh jerseys were short lived. Hojnowski said that the wide mesh did help to keep players cool particularly for warm weather games. But after four years the wide mesh jerseys were discontinued by the league. Buffalo’s equipment manager believes the rising popularity of the game on television was part of the reason why the wide mesh jerseys were on the outs after just four years come the mid-80’s. “I believe that they discontinued those jerseys because as TV got more and more involved and more and more dollars were being spent, I believe that television was the one that nixed those jerseys. You have some linemen where their bellies were sticking out or whatever and those jerseys were not flattering. Bills CEO Russ Brandon was on 97 Rock this morning to talk about the team’s uniform unveiling and he was also asked about the NFL owners’ meetings, which he attended in Chicago Tuesday. Brandon obviously could not provide details on the uniform, but explained how the club arrived at this stage. “We go through the process and it’s about an 18-month process and there are a lot of hoops to jump through,” he said. “We talked quite a bit with Mr. Wilson and went through a long process with the NFL and our people internally and our players and decided to make a change. “Everybody is a stakeholder in it. Mr. Wilson, our players, our marketing and merchandising people really over the last five years have had a hand in it. Changing the uniform is an 18-month process. The guys in the equipment room from Hojo to Woody to Jeff Mazurek have a part to play because the jersey has to hold up from a performance standpoint. When asked about the nature of the owners meetings Tuesday, Brandon explained how he was prohibited from commenting. The uniform unveiling is Friday night at 7:30 pm. Complimentary tickets can be picked up at WNY M&T Bank and Verizon Wireless store locations. Tailgating is permitted prior to the event.